Hello everyone, Lately I've been keen on getting started on pottery. I guess the creative aspect of it is what attracted me to the concept in the first place, and that I can practically turn it into any piece of art I wish! I haven't begun any practical experience or even laid my hands on clay as of yet, just reading and watching beginner videos every now and then. 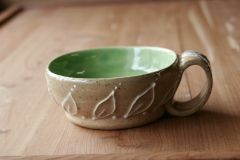 I do have a local pottery-making studio that offers packaged sessions and they are quite pricy. I'm wondering about turning it into a hobby and I hope I end up liking it when I try it. 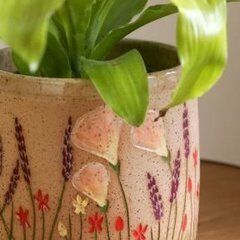 I am also glad to find this forum that gathers a community of pottery makers, I could learn a thing or two and discover some advice. Do you guys have any tips and insights, or stories on how you got started? Is it a difficult hobby to master? What's required of anyone getting into the pottery business? What are the best steps to take when you want to begin and continue along the right path? And in your opinion, whats the best clay to use and technique when designing? Thanks! Looking forward to your helpful comments. Hello, Introduction first. My name is Mara and I have my own Small metalwork studio and make jewelry with unusual things, including ancient beads. I had been In LOVE with the idea of ceramics and pottery since a child and now, for first time I decided that never is too late to start and bought my very first kiln, a firefly Paragon manual seemed less intimidating, and added to the purchase some clay and raku ready to start touching for first time the parcel of heaven that it means to me being able to create things with ceramics. Is so much beauty to create, so many things that can be done!!! SO much to Learn... The problem? I had never SEEN a kiln before except in pictures, never used one, I don't know any kiln user, so... I have Zero idea of what to do and in a binge search after decided to click the "pay here"button at the store where I got the kiln in a sudden moment of courage found this forum where I read simple, understandable, amazing information, the communication is fantastic and far for being the intimidating breed that is always to impress the other members with succulent words I realized in here everybody seems helpful and forgiving with extra beginners like me. I will be probably asking the silliest most obvious questions so, when that happens please remember I had never ever ever seen a kiln working, been in a pottery studio, do more than Play with the air dry clays with the burning desire to make it "real"solid. I would love any help, from what to do after the kiln arrives -My eyes are rectangular for watching way too many youtube videos trying to find a more visual answer- How it was the first time You fired a kiln? It arrives, -How big it as to be the room? It can be a small room? - Then, you set the wondrous new element far from the walls, check if inside all seems ok and connect to the outlet -mine seems to work with a regular household electric outlet- trying to understand what the manual says... But... What would You tell to somebody that will be standing in front of a kiln that has to be done in this very first experience? I found zero info about that, I guess because most people that get into this passion already had at least proximity with the process, seen somebody, something. Second silly question I found still No answer. I don't want to glaze the pieces -that will be small jewelry size-. re they already strong enough or the second firing with the glaze gives the pieces the desired strength? Yeah, I know... I'm in a below zero level, hey, But I want to learn, and I'm enthusiastic!!! Thanks in advance for the Patience and super thanks or the fluid way you all explain the processes. McRocks. Hello. 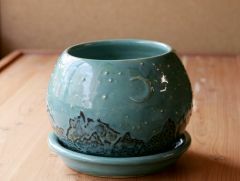 I’m new to the world of pottery and so far I’m in love. I’m currently taking a weekly beginners wheel course, but I’d like to really invest my time into the clay. So I’m looking for recommendations on a beginners potter wheel. Below is what I think I’m looking for. Any feedback would be wonderful! Primary use: Hobbyist. Wish List: relatively quite (it doesn’t have to be silent, but at least not sound like a truck), metal bat versus plastic, Can Handle a good amount of clay. I’m a beginner now, but don’t want to “outgrow” my wheel once my skills progress, & variable speed There’s always the option of purchasing new, but I’ve seen a few listed used, including the following: AAMACO Model 101 $380 Speedball Artista $200 Pacifica GT400 $400 I’ve included some of the used prices so hopefully a more experienced eye can tell me if it’s a deal or a rip off. Thanks in advance for all the feedback. I just accepted a secondary Ceramics and Sculpture position, and I'm waiting for the school district to install HEPA air cleaners before I can start teaching ceramics. Here's the catch: the district is unable to state when they'll install the new equipment (it could be tomorrow or in 6 months), but I still have to teach a group of 30 9th and 10th graders who are enrolled in a course titled "Ceramics 1". What could I teach my class that will still be relevant to ceramics without the clay (bizarre, I know!)? Right now, I have modeling clay, a project where they draw 50 different 3D forms, and a unit where they divide into groups to research and present the history of ceramics to each other... but I'm stuck beyond that. One last tricky bit: many of my Ceramics 1 students are also in my Sculpture 1 class, so I want to keep standard sculpture projects out of the ceramics class if possible. Thanks in advance for your help! I've been running a lot of searches for information since I've just begun a wheel throwing course. One thing I routinely see, are people discussing the drastic variation in teaching content/quality of instruction found on the internet. Since I'm so new, I have no way of telling if someone is demonstrating good or bad technique, etc. 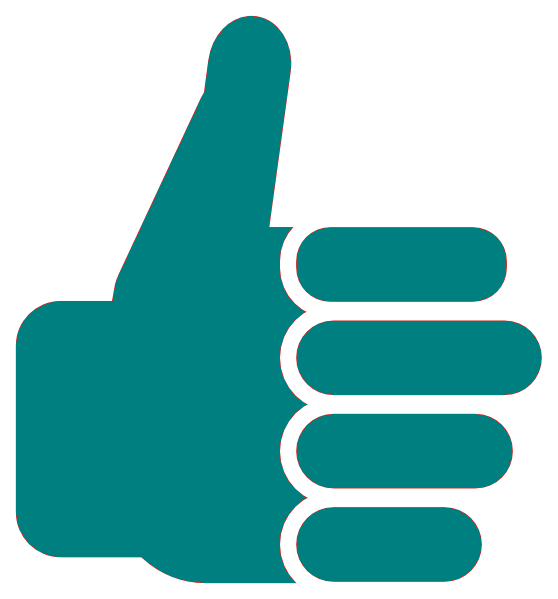 I'm hoping people would be willing to list resources that have quality instruction. Beginner to advanced instruction would be appreciated. I'm just learning to crawl but I recognize others are doing gymnastics and decathlons. I've heard Simon Leach's YouTube channel has quality instruction and I've seen someone recommend Florian Gadsby's instagram https://www.youtube.com/user/sleachpots Here's Simon Leach's page https://www.instagram.com/floriangadsby/ Florian Gadsby's instagram Any references to Youtube channels, books and online courses are appreciated. 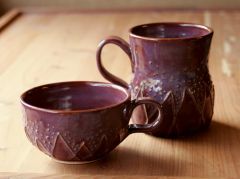 My Favorite Clay Types + Glazes: Whats The Recipe For Perfect Bisque And High Fire Glazes? 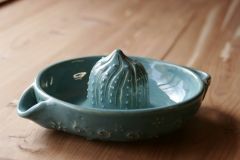 After all the fun stuff is gathered (kiln, wheel, tools, clay, glazes) and you are ready to throw your work into the fiery pit, what temperature should that pit be and how long should you bisque it? I have my favorite clays and glazes (I am using my professors kiln and wheel for now until I get my kiln at home figured out) but I have yet to get a good answer on the correct temperatures and times my bisque firings should be in the kiln. I have mostly been observing and creating the works with glazes while others load and monitor the kiln/firing process (plus they are massive front load kilns over 6' tall and 6' wide). Here is the scenerio: I am using Amaco No. 58 (a red clay). It is a cone 5 clay, but what temperature/cone and how long do I bisque it? I want to put a Cone 5-6 Amaco Shino glaze on it. 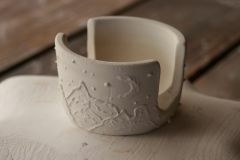 I load the kiln with the glazed pottery and leave it in there at the setting of cone 5 for how long? I understand it sort of varies depending on the quickness and efficiency of the kiln, but what is the general rule? I am using Amaco No. 11 (a off white clay). It is a cone 5 clay. Same as above, what cone and how long do I bisque it? I want to put on a Cone 5-6 Amaco PC33 Iron Lustre glaze. Once the pots are glazed how long will it take in the kiln? I am just looking for general estimates and I chose simple clays with same-brand glazes to reduce the possibility of bubbling/bloating/other problems. I will be keeping a log and most likely be testing my kiln for quite a while before I delve into putting my better work in it. Any simple formulas would greatly be appreciated! Proper Hand Position For Wheel Throwing? As some of you may know, I am a beginner on the wheel. I started learning in October of last year when my dad set up his new wheel in my garage since he doesn't have a spot for it yet. (Ohhh the sacrifices I make for him ) In the past year I have gotten to the point where I can pretty much make what I want, though I still can't handle anything over five pounds. I don't feel I'm qualified to teach anybody else, but my dad is really struggling. He wants to retire from his masonry business and use pottery to supplement his pension, so there is a lot of mental pressure on himself to make a success of this as soon as possible. I know from my own experience that this kind of thinking makes the learning go much slower, and I've told him so many times, trying to encourage him to be easier on himself and give it time and patience. Today he came over to throw and I noticed this weird thing. I'm right handed. I throw with the wheel spinning counter-clockwise. When I'm lifting the clay I have my left hand on the inside of the pot and my right hand on the outside at around 3 or 4 o'clock. My dad is also right-handed and uses the same setting on the wheel. But he does everything inside the pot with his RIGHT hand, and the outside with his left. His hands are at 8-9 o'clock on the wheel. He has lots of problems with gouging the pot, thin spots, collapses, etc. etc. etc. and I think that might be why. I told him and he laughed and said that he's always thrown this way ... I never noticed before because he really doesn't like help so I leave him alone when he comes over to throw. He threw one pot "my" way and it actually turned out pretty well but he said it was strange and went back to "his" way with the next pot. My question is, which way is correct? If "my" way is correct, then is it easier to re-learn this way, or should he try throwing on the wheel with the wheel going clockwise instead, as if he's left-handed, and otherwise keep doing everything the same? Any advice or suggestions? (By the way, I think he would benefit from a wheel throwing class but I know he won't do it. He's really discouraged right now.) Is it possible that his struggle with throwing can be as simple as having his hands in the wrong position? A shelf full of my dad's pots. I think he's made as many this week as he has in the whole past YEAR. He overcame a huge hurdle when he started throwing left handed, even though he's right handed. His pots have changed and improved in leaps and bounds. I'm almost as excited for him as if it was me making this progress. This picture makes me so happy that I wanted to share it. I started learning to throw last October. It was a very, very bumpy road and I didn't start having things to keep until mid-February. I almost gave up. To be honest, I did give up, for weeks at a time, but fortunately kept going back to it. The pitcher on the left is one of my very first "keepers", a little mug that I knocked against and decided to turn into a cream pitcher. It's one of my first attached handles, beginner slip trailing, the whole nine yards. The pitcher on the right was made about six months later. It's a pitcher because that's what I decided to make, not a mistake. I deliberately decorated and glazed it similar to the other one because I wanted to see them side by side like this. In every aspect of these two pieces, from the throwing, to trimming, the handles, decoration and even the glazing, I can see how much I've learned in less than a year. I can't wait to see what happens in another year! Maybe I'll be making pots that levitate or are invisible or something. Who knows. On the left is perhaps the seventh or eighth wheel thrown piece I completed. It's a cream pitcher because I knocked against it and bent the lip. 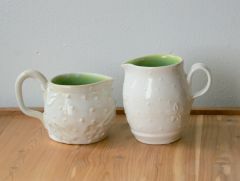 On the right is a cream pitcher, deliberately made six months later. I made it in a very similar design with the same color combo because I wanted this side-by-side comparison. It makes me very happy to be able to SEE my progress like this. In advance I apologize for my 'potty' question as most of you are professionals. I have been trying my hands at throwing for one year. Finally I get the wedging and even the centering :-). But as every time I tackle one problem a new one appears, my newest challenge is air trapped between the clay and the wheel. I form the clay into a ball and throw it down on the wheel, tap 5-10 times and then I start centering. 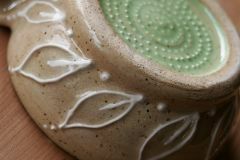 When I open I feel the air bubbles unter the bottom of the clay or toward the rim. What am I doing wrong? I really appreciate any help you guys can give me. Greetings. D.
My second wheel thrown mug I ever made! 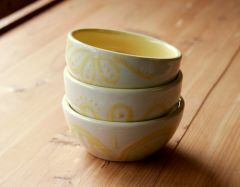 Close up of the design on my little set of stacking bowls. This was my first attempt at "production" (making three of the same size and shape). There is some variation but they turned out clearly a matching set! I was quite pleased. The inside was painted with a creamy yellow engobe before bisque firing, and the outside was decorated with the same engobe and coated with clear before the final firing. I wanted to see if the engobe would end up different colors but it didn't change a bit. This is my very first time throwing four pounds of clay. As I gain skill I know I would likely be able to make a larger pot, but I was extremely happy with how this turned out. This was also my first attempt at making a matching saucer and it fits ... well ... like it was made for it. The surface is decorated with a combination of Hawaiian Red slip and white stoneware slip. My second wheel thrown sponge holder. Slip trail decoration with a mountain scene and crescent moon. 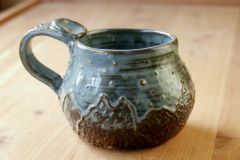 The mountains will be rubbed with iron oxide and the rest will be glazed a lovely layered blue that breaks over the slip trailing. 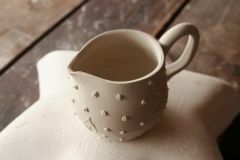 My very first cream pitcher. Thrown in B-Mix clay from Laguna and decorated with slip trailing and stamped with one of my handmade flower stamps. I plan to glaze it in a creamy peach that will show white over the leaves and dots.